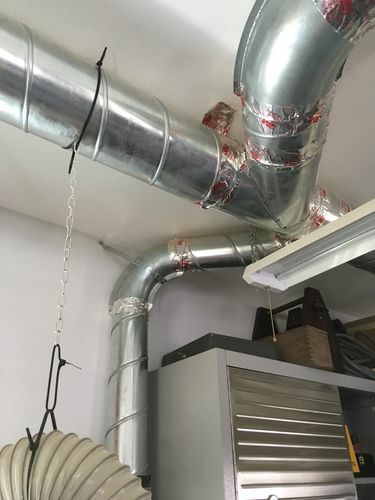 Just started running DC ductwork, any issues here? This is my first DC setup and I have read up a good bit and all the information and opinions can overwhelm you. 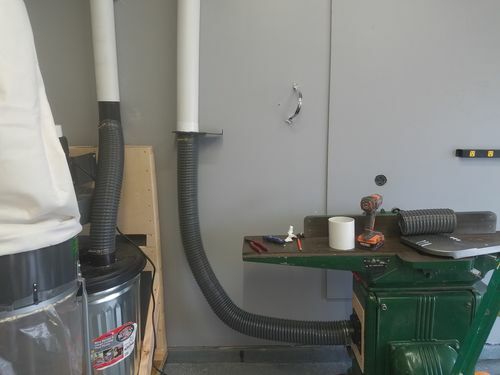 So far I just have it run to the jointer and up top I have it capped off where I am going to run it all the way across that wall with a couple drops. One drop is going to run to the floor then underneath the workbench in 2nd picture. 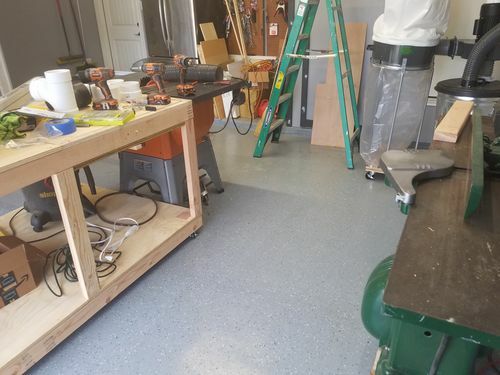 Once under bench, one path will run to the table saw on the end and another will run to the other end where I will have an older Delta Rockwell Unisaw that someone just gave me. Other drop will go down to the Powermatic 18” bandsaw I have coming in. For what is run so far, does it look proper? 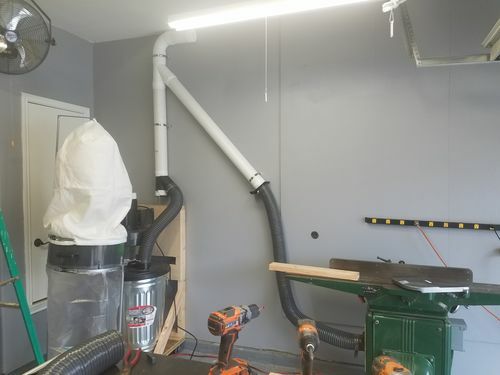 From the picture it seems like you are planning that dust will go from your planer, up to the y-section and then down to the shop-vac. If that is correct it will not work very well as the turn on the top is way to steep. You should follow the air-stream from the source (the planer in this case) to the destination (the shop-vac). In this you should have as few steep bend as possible so that the air and dust has a little resistens as possible. I wouldn’t do it that way. Like TEK73 said, that wye is really going t hamper the air flow. Better to flip it over, then another 45 to the jointer, and then down to the pick up. I also think the way the DC is hooked to the duct isn’t very effective. You want gentle turns, and oriented the correct way to have the smoothest flow possible. Ok thanks guys, I’ll make those corrections before going further. This is why I posted this haha I figured I would F it up, live and learn. Ignoring that it’s not secured to wall fully, does this look better? 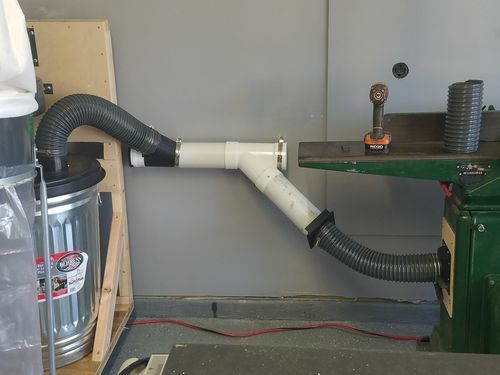 Should I bring the pipe to the jointer lower and have a shorter flex hose? Also, I shortened the hose from the DC to the piping and removed the bend in it. Thanks, makes sense, but I was running all the way to the ceiling to preserve that wall space. That is the only free wall available in my garage and was going to run some French cleats for a little tool organizing to be readily accessible. Scrap that T fitting, and the short radius 90. You must use Y fittings and long radius 90’s to make this work. 45 degree fittings are also ok. You need long, gradual bends for good flow. No…the Y needs to go in the direction of flow. Would be better to come off the top run then it is angling down toward your jointer. Also the 90 up top needs to be eliminated for a Y or two 45s to soften the curve. Running to the ceiling and back down is fine IMO. All of you other drops will come from the ceiling. It is typical, especially in small shops, to run in the ceiling. You don’t have to run it in the corner. You could run it a couple of feet out from the wall and 45 to the wall where you need a drop. Run it straight up over the cyclone can and then along the ceiling. For each drop use a 45 to angle to the wall then a 90 to the drop. This gives the advantage of saving the top wall space and giving you a horizontal to avoid pileups in your drops. Having a horizontal off of the main before the vertical drop is the recommended method. Having the drop go down from the main allows dust and chips to go down the drops. You’re good going to the ceiling. You will gain some by changing the short radius wyes to the long radius type. Since those are never in stock (anywhere) a work around is to use 2-45˚ wyes with a short piece of straight pipe between them. I also think that it’s OK to go to the ceiling, I do it myself. However, going up to the ceiling and then go down again 30cm to the left does not seem resonable to me. 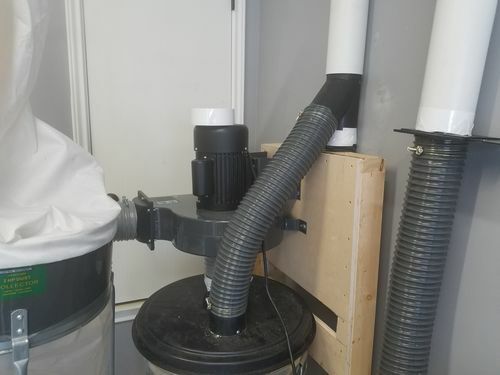 You do not free any wall space, you consume it, and the suction will be lower than if you go direct. So for equipment further away and spread around the shop, use the ceeling (or close to the floor) to save walll space. But for the planer in the picture and the duct fan in that location, I would have gone as short as possible. Maybe a y-joint directly on the hose (if you are able to mount the blast-gate). For the rest of the tools, I would go ceeling if there are some distance. You re good going to the ceiling. You will gain some by changing the short radius wyes to the long radius type. Since those are never in stock (anywhere) a work around is to use 2-45˚ wyes with a short piece of straight pipe between them. ^^^^^ Definitely long radius wyes. This solution gives you 180 degrees worth of bends before you even get to the ceiling. You never want to come directly from a bend into a cyclone – especially with a flexible pipe. It disrupts the smooth airflow needed for the cyclone to work properly. Not a good design. Come out of the cyclone straight to the ceiling. A sweeping 90 along the ceiling. Then for each drop a 45 wye to the wall then 90 down. Hey all, I really appreciate all the input and am trying to implement what you’re all suggesting, but I have to wait till this weekend to start knocking it all out. Here is what I have so far, please tell me this is sufficient haha. 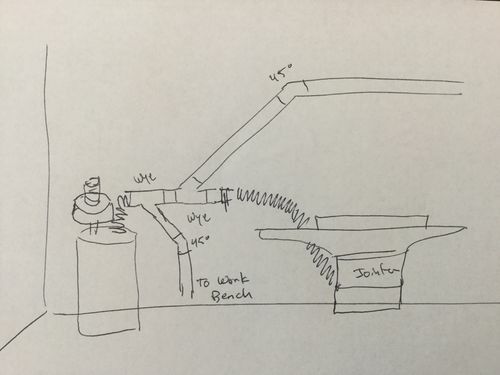 I will be adding more pipe to the right to a bandsaw and also dropping to the floor and running short distance across the floor to underneath the work bench where I will Y off to both tablesaws. 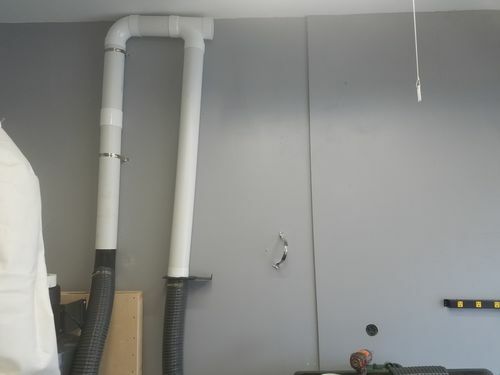 Anyway, I shortened the flex hoses and went ahead and ran ductwork down low realizing at that level it won’t really be in my way, will be easier to access should I need to and will use less pipe, shorter runs and should help maximize suction, compared to longer runs all the way up to the ceiling and back down.